Wacom is changing the way creatives work with the launch of two intuitive design tools. This morning at the Consumer Electronics Show 2017, Japanese tablet company Wacom unveiled two products that bridge the gap between traditional and digital graphic design tools. These two new tools continue Wacom's tradition of shaking up how people work as they look set to change how creatives record ideas and approach their drawing techniques. First up is an addition to Wacom's Bamboo family of smartpads: the small Bamboo Folio. Geared towards creatives who lose their genius ideas amongst their clutter (so, practically all creatives), the Bamboo Folio is perfect for on-the-go note-taking and idea generating. 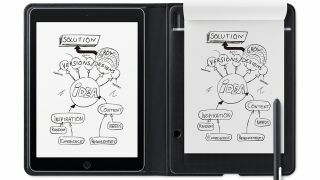 The A5 smartpad lets users turn their handwritten notes or sketches into digital files with a simple push of a button. Featuring the same technology as the larger Bamboo Slate and Folio devices, the Folio is integrated with cloud services and the Wacom Inkspace app, making it easy to edit and access files anywhere. “Our Bamboo smartpads are made to naturally fit into any workflow, fusing the ease of writing naturally on pen and paper with digital technology to transform thoughts to ideas,” said Mike Gay, senior vice president for Wacom’s Consumer Business Unit. Priced at $149.95, € 149.90, £104.99, ¥ 18,000.00, you can learn more about the Bamboo Folio on the Wacom site. Next on the agenda are the Wacom Intuos Pro, the Intuos Pro Paper Edition, and the Pro Pen 2. These new tablets and pen eliminate the hassle of scanning in physical artwork. Working like a piece of paper connected to Photoshop, the Wacom Intuos Pro skips the scanning process and creates digital ink versions of sketches at the touch of a button. Ink-on-paper drawings are captured and stored digitally on board the Intuos Pro Paper Edition and can be refined later on the tablet with any compatible layered raster or vector software application. Meanwhile, the new Pro Pen 2 anchors the overall creative experience with enhanced pressure-sensitivity and precision. “We know it’s challenging to bring ideas to life when the tools lack the ability to easily unlock the potential of creative minds,” said Masahiko Yamada, President and Chief Executive Officer of Wacom. Available in medium and large models, Intuos Pro is Bluetooth-enabled and compatible with Macs and PCs. The Intuos Pro comes with the Wacom Pro Pen 2, pen stand and features eight ExpressKeys™, a TouchRing and multi-touch gesture control. The Intuos Pro Medium ($349.95 USD, £329.99 GBP, €379.90 EUR) and Large ($499.95 USD, £449.99 GBP, €529.90 EUR) will be available in January. Intuos Pro Paper Edition will contain added features as a bundled package to enable paper-to-digital creation. The Intuos Pro Paper Edition Medium ($399.95 USD, £379.99 GBP, €429.90 EUR) and Large ($549.95 USD, £499.99 GBP, €599.90 EUR) will be available in January.